Few of my blog articles are motivated by so many factors. I am going to post this in both of my blogs. We are faced with a manageable crisis in our office. The last time this happened, my remarkably efficient assistant walked out of our office on four days’ notice. It was a crushing experience, but it had a happy ending, until now of course. The current crisis is that one of my best employees ever has informed us that she must move on in order to assume duties of a near full time stay at home mother. Consider that she has had four children in eight years, two of whom are under two. The plan was she would bring the little one to the office, which she has, but even though he is the prototype perfect baby, we have to have empathy for someone who does not want to “run a military household. I am not mentioning names, but they know who they are. Fourteen years ago when my “Gal Friday” promised two weeks’ notice and then told me at Friday at 4:00 p.m. she wouldn’t be there on Monday my staff included two bright, eager, fearless, trainees. I turned over the responsibilities of a 36 year old marvel of efficiency to two young ladies whose ages totalled the one who was leaving. 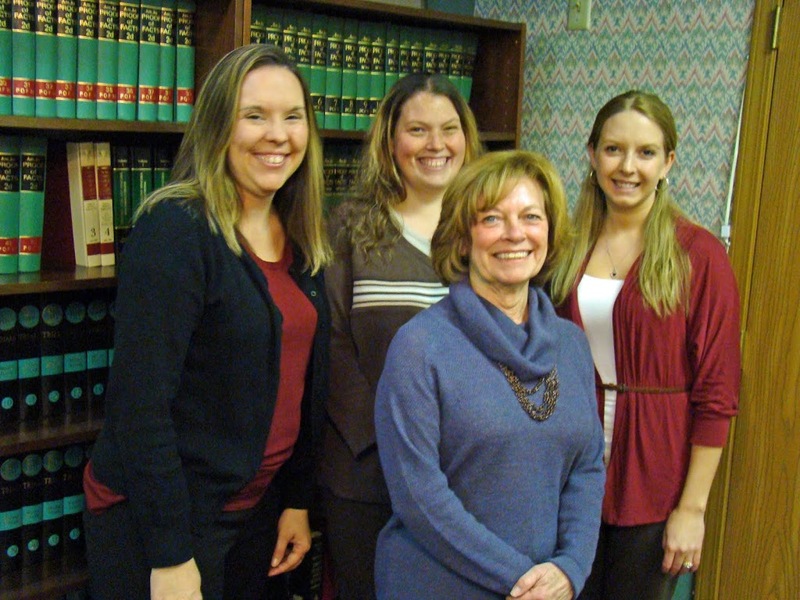 Since then, each of them has graduated with honors from 2 year paralegal programs. Our steady billing and filing clerk/receptionist and my wife Nancy were the “grownups” during the transition to two paralegals, but J…. and L……….. (remember, I said they are fearless) simply began doing the job of their predecessor. And also since then, our experienced employee retired so she could care for her aging Mother, 2-4 trainees did not work out, or moved on, and we have been blessed to find a WV Wesleyan Honors graduate, who was accepted at law school, but elected to stay with us and get her own paralegal certification from W.V.U.’s online educational program! Yep; even though we are losing a wonderful person, we still have 3 experienced, competent, people. If you have read my other posts, you know I delegate well, am a bit obsessive, and have plenty of work for at least four staff members. I was so pleased last year that my staff had become so efficient that we did not have to replace our receptionist trainee when she left for home and pregnancy. I wish our technical efficiencies would let us adjust to 3 full time staff members, but clients expect great responsiveness from us. We must be able to maintain efficiency through vacations, illness, and personal time. For me, that requires a staff of four. 1. Intelligence. No doubt about it. I am smart, and you need to be smart to work with and tolerate me. 2. Fearlessness. I was, properly, gently chastised by a Facebook Friend for announcing a year ago that I was interested in finding an inexperienced, young, trainee. She wanted to know why not an older employee who had worked as a stay at home mother or in another field. 3. My response: If I can find a person who is bright, with acceptable fundamental skills, who has not been ruined by a traditional, non-innovative, office manager or lawyer, I can mold her (yes; I have never had a male assistant) to my way of thinking and doing things. When I try to train someone over 30, they tend to be rather flustered. Tears flow. 4. I am NOT an abusive boss. I am inpatient. I am driven. I point out errors and demand that my employee correct errors, and fix recurrent errors. 5. Out of every 100 requests by an employee to take off time or adjust her schedule, I have tended to agree 95% of the time. I encourage them to educate and improve themselves, I encourage them to bring the babies to work, and I agree to flex time: working at home a day a week, or even wokring a four day week. In return, when the staff is here, I expect focused, hard, work. 6. Even if my criticism causes a few tears, or my volatile nature causes occasional embarrassment, here’s what I expect. a. If I hurt a feeling or bawl someone out within earshot of a client, TELL ME if I hurt or embarrassed you. b. I will try to do better next time, to adjust my level of criticism to something you can tolerate, and I sure will sincerely apologize. c. But, in our office, we must care! When people care, there is passion, and when there is passion, there are occasional loud voices, anger, and “animated discussion”. 7. A chronic challenge for me in dealing with graduates of B.U.H.S. is those graduates do NOT get sound grounding in English grammar, punctuation, vocabulary, and spelling. Part of this is societal, but, in my opinion, part is a refusal of Upshur County to set high standards. It is embarrassing to spend an extra 20 minutes every day of my life showing bright, capable people where to put commas. We are talking of tens of thousands of dollars of wasted productivity because of a tradition in mediocrity. b. So, also does a compound sentence. A compound sentence has two clauses, each with a subject and verb. d. If you put a comma where a period is indicated, you have committed the dreaded “comma splice”. For Captain David Judy at Linsly Military Institute, a comma splice was a 20 point deduction, so a theme paper with a comma splice could never be graded higher than a C.
9. Let me digress further. (Farther is distance; further is degree.) Good food is “healthful”, not “healthy”. You hope, and I hope; but sprinkling “hopefully” gives no indication of who is doing the hoping. We want to return to normality, not “normalcy”. And our staff is not going to call you “sweetie”, “honey” or “hon”. We occasionally end a sentence with a preposition or allow a split infinitive, but I was blessed at Linsly with superlative English teachers, Don Clutter, Capt. Judy, Capt. Gordon and others, and I will keep correcting the fundamentals until you do it right. Why can’t our English teachers do the same? 11. The best employees care about out clients. They listen to them. They report accurately to me, especially when a client is frustrated and unhappy. 12. The best employees are not afraid to make decisions, gently chastise a client, act as a buffer when my blunt ways do not suit a particular client, and religiously follow our checklists, policies, and procedures. I must have files prepared in detail, pre-hearing, pre-mediation, and pre-trial checklists completed, witnesses subpoenaed, and concerns reported to the lawyer. 13. Finally, a rare quality in the typical applicant for a legal assistant’s position in a small town is someone who is well read, curious, and ambitious. People with these qualities often move away. This is a simple fact, but a person can decide to stay a “small town person” and still be interested in the larger world. When they are kind enough to work with me, I like to encourage these qualities. 1. Since my practice does not include criminal defense (except domestic abuse and violence), I would like my paralegal to focus on civil litigation, personal injury, insurance law, and the family court. a. The Rules of Civil Procedure. These cover preparation and filings of pleadings, motions, related affidavits and cover sheets. They also cover the “rules of discovery” which are key in gathering information from the other side about the disputed and undisputed facts. b. The Rules of Evidence. The paralegal must understand things like “the hearsay rule”. I have occasionally had an employee getting a “character reference letter” from someone when “character” is not a issue, and even though it is “hearsay”. A good paralegal knows what statements are needed and why. They can be very helpful during negotiations. The paralegal must also be able to create a clear summary of what we believe the witness is going to say at trial. But, if there is a trial, we still need that warm body there. The paralegal must subpoena the witness or document in plenty of time to them to be at trial. It is essental for the paralegal to be able to interview witnesses, reduce the statement to a concise written statement, and follow up with the witness to get it proofed, corrected, and signed. c. The Family Court Rules. Judges apply these rules differently, but even a self represented party is supposed to know the rather complex rules that determine procedures for practice in family court. d. Appellate Rules. We appeal cases, from family court, to circuit court, and to the WV Supreme Court of Appeals. Magistrate Appeals also go to the Circuit court. Missing a deadline by a day can be fatal. a. Until 1863, the law in Buckhannon was the same as the law in Richmond. They were both in Virginia! b. Back then, much of the law derived directly from “The English Common Law”. The common law was rules and traditions which our ancestors brought from England. c. Even today, if a common law rule has not been changed in Va. and W.V. since 1863, the laws are the same in both states. d. Our legislatures create statutes. They are contained in The WV Code. e. Statutes and the common law are interpreted by the courts. Family Court, Magistrate Court, and Circuit Court may not change the law, even a bad one. The WV Supreme Court of Appeals can declare a law unconstitutional. An example was the law that required a divorced father to contribute to his child’s college expenses. Apparently, Hawaii still has such a law, but ours was abolished because our supreme court almost certainly was going to rule that such a law denied divorcing dads and moms “equal protection” which is guaranteed by the U.S. and WV Constitutions. h. Graphic design, photography, PowerPoint, etc. Now it also makes no sense for a paralegal not to know about Facebook and the entire universe of social media and marketing. The paralegal must be scrupulous in their own posts and communications, must be highly sensitive to issues of confidentiality, but must be able to locate critical evidence, which is consistently showing up on the Internet. The exception is now nearly the rule, but computer postings will come up in most cases.